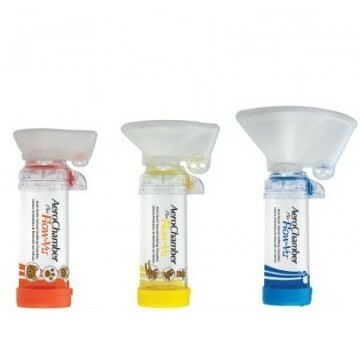 AeroChamber Plus Flow-Vu Anti-Static Valved Holding Chamber (aVHC) is a device available by prescription only for patients who may have difficulty with the coordination and control involved in using Metered Dose Inhalers (MDIs) correctly. The Flow-Vu Indicator allows the caregiver to visually monitor if the patient is inhaling correctly as the flap moves when patient inhales. The Anti-static Chamber improves the delivery of Metered Dose Inhalers (MDIs) used with AeroChamber due to medication not adhering to chamber walls. The ComfortSeal® mask provides critical face mask seal and is soft and comfortable. "EZ Flow" Exhalation Valve directs exhaled medication away from the patient's face and eyes. Built-in, low-resistance, one-way inhalation valve opens easily and prevents exhalation back into the chamber. Take-apart unit allows for easy cleaning and is dishwasher safe at temperatures below 158°F (70°C).